This robust hydraulic gauge is designed for permanent installation as well as for occasional force checking. 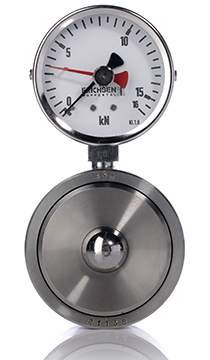 The robust construction of this hydraulic force gauge from Erichsen Wuppertal is suitable for rough operating conditions on machines and installations and is especially suited for large surfaces. It can be used for occasional spot checks as well as integrated in a permanent installation. This Erichsen force gauge comes with an alignment ball for easy alignment of your load. The standard instrument is fitted with a 63 mm diameter gauge with maximum reading pointer.